Award-winning Celebrity Goat Cheese is getting a delightfully warm and inviting twist! As delicious as a home made apple pie, this new goat cheese combines the tangy creaminess of goat cheese that features an apple pie ice cream swirl, then rolled in bits of tasty caramelized apples. Ideal for a number of uses from brunch to dessert, this cheese will be an instant crowd pleaser. Try spreading on a bagel for breakfast, or mixing into a cheesecake/apple pie hybrid! Applications: Make a traditional sour cream apple cake, and replace the sour cream with Celebrity's Apple & Cinnamon Goat Cheese! 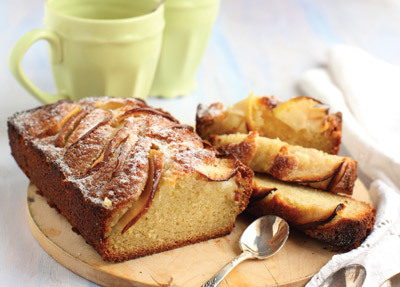 The bits of apple will provide extra texture to this already classic and delicious dessert treat! Pairings: Try with a light Sauvignon Blanc or a delightful Fruit Lambic beer.